Michael Bell (born July 30, 1938) is an American actor, voice actor, voice director and animal-rights activist who is most active in voice over roles, known for his youthful voice. He has acted in video games and animated series, including The Transformers, G.I. 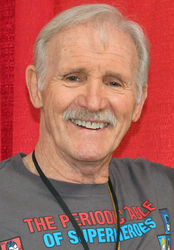 Joe: A Real American Hero, The Houndcats, Rugrats, The Smurfs, and Snorks and appeared on-screen in film and television, including the TV programs Dallas and Star Trek. Bell was described as being "one of the most prominent voice actors of the 1980s." Both Bell's wife, Victoria Carroll, and his daughter, Ashley Bell, are actresses.